It was hot when the plane arrived in Salzburg, and 39 the next day. 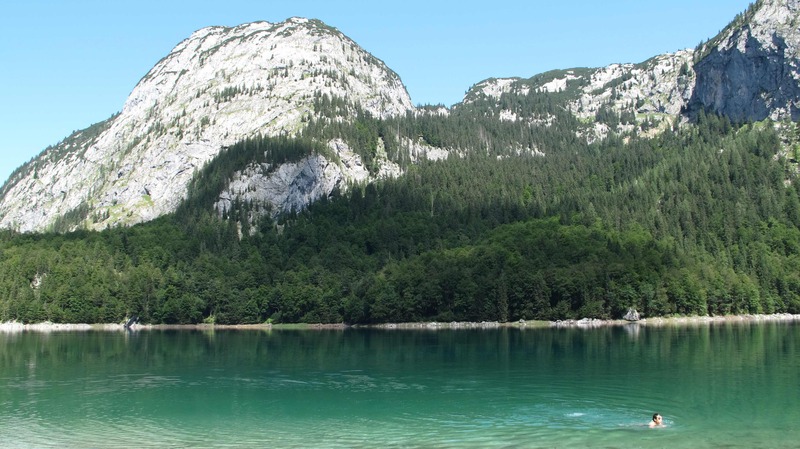 I had no idea central Europe could get that hot — during the seven weeks we were away I think I wore long pants twice — and Salzburg is full of light-coloured surfaces which dazzle in the glare. We wandered round the streets, stumbled across a modest but very fine Andy Warhol exhibition and did find THE place to eat, Alter Fuchs in the Linzer Gasse, and enjoyed their very fine beer. 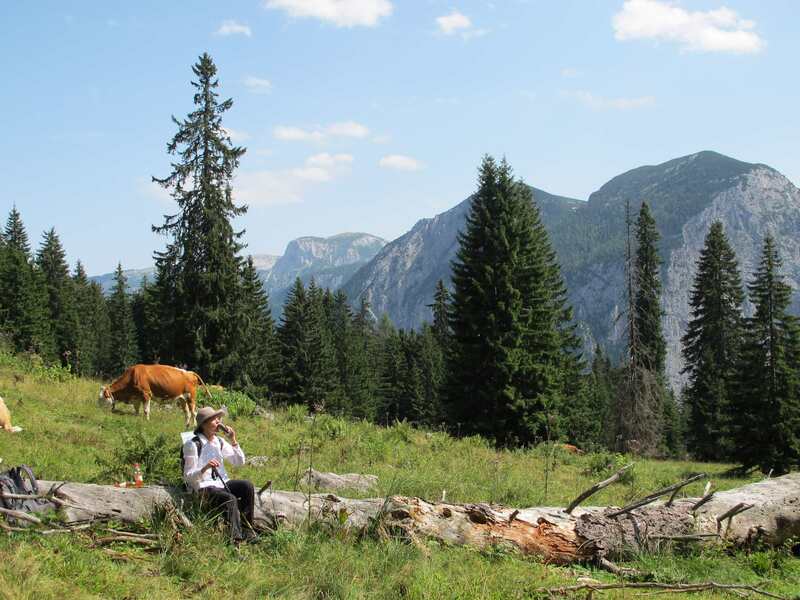 But we weren’t there to eat; we were there to circumnavigate the Halstattersee, six days of walking in the Dachstein alps. The cause was a viewing, for me for the first time, of the film of The Sound of Music, that extraordinary and not a little weird (3 hours; big weird) glimpse of populist perfection. And in the beginning, just before we fling ourselves into the arms of England’s darling and commence noting that the hills are alive with the sound of etc., there are 90 seconds of helicopter shots of some alps. These looked like fun to me. The splendid folk at Sherpa were offering an unguided trip there, and we went. Had the gloves, the beanie, the polypros top and bottom, the polar fleece, the Goretex (registered trademark) and needed none of them. 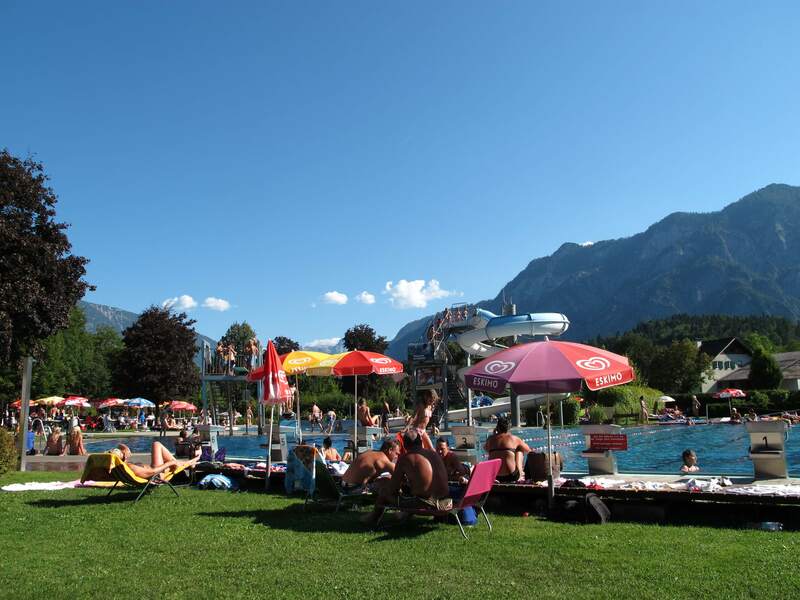 We took the train to Bad Goisern, about two hours east and then south from Salzburg, and found things equally hot but quiet-ish, if not so at the pool. Quality bombs issued from the high board, but those performing the near motionless breastroke (as I remember from Switzerland, the central European stroke of choice) were left undisturbed. Very Austrian. We did laps because we’re Australian. The shell of this pool (and the other one we swan in at Gosau, not in such immaculate condition) was made from welded stainless steel. Given the difficulty of welding stainless steel (Keith), what can I say? A masterpiece. It was certainly lovely to swim in. It was pretty quiet when we left next morning for the first day of walking as well, even though the clock indicates that peak hour was upon us. The first day was something of a warm-up. 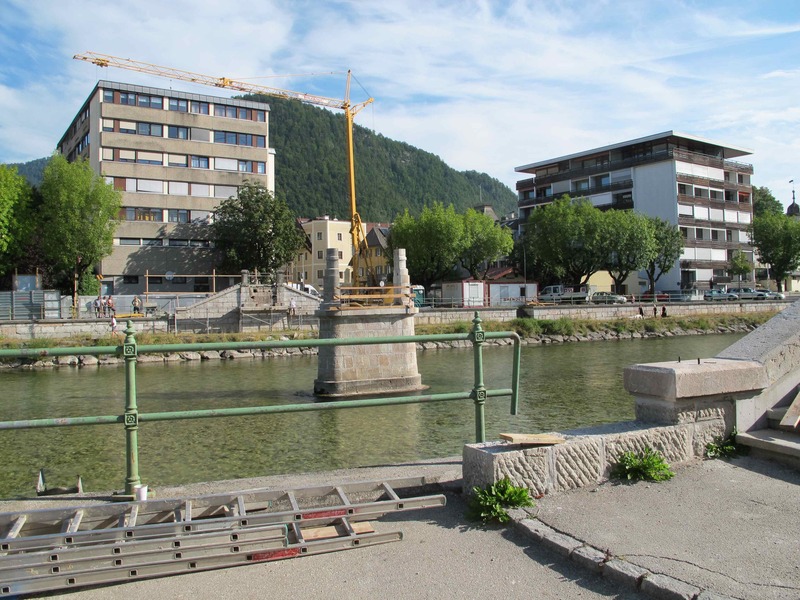 A train backwards, so to speak, north to Bad Ischl — a slightly larger and equally pretty town, famed for its waters — then walk back to Bad Goisern climbing over Predigstuhl on the way. Predigstuhl turned out to be a big stump of a thing rather like a volcanic plug although very clearly limestone; not very high, but ‘hang on to the tree roots to move upwards’ steep. The track notes warned of mud. Dust was a much more salient problem. The track notes also began — Note Number One in fact — with a direction to cross this bridge. Yes this one. There. To the left. Described as elegant. It may well be again, but some time in the future. Hiding to the right of the picture, however, is a perfectly acceptable alternative. 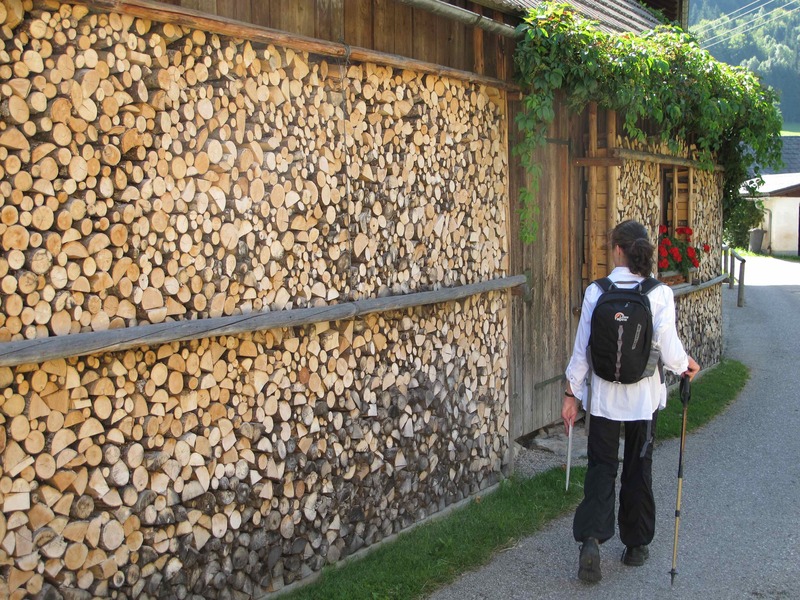 Stacks of wood, carbon copies of the one pictured here, were a feature of the walk. Walls of fuel, it would seem to be disappointing to tamper with them for functional purposes. From the top of Predigstuhl we got our first look at the Halstattersee with the Dachstein proper (with glacier) behind. Bad Goisern is at this end of the lake. 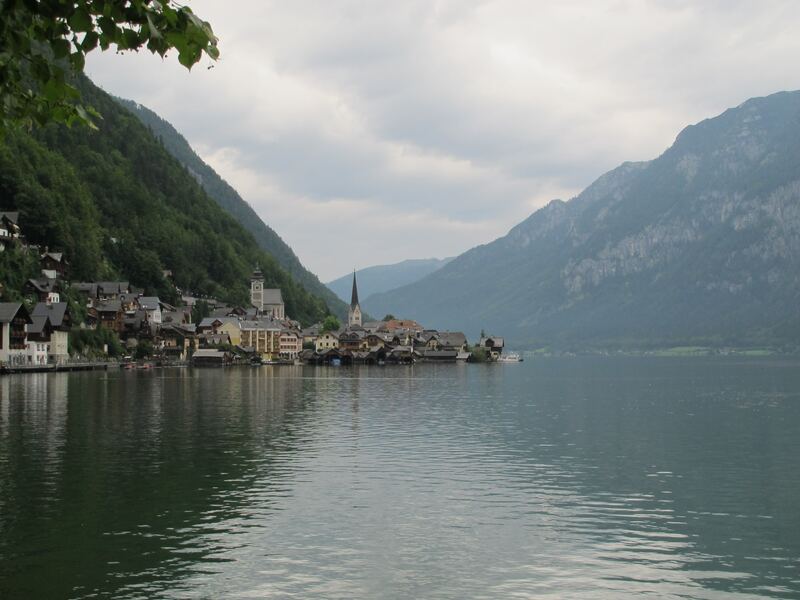 The idea was to climb up over the range to the right to another small town called Gosau, then back over another alp (or alm) to Halstatt, invisible here at the lake’s end. 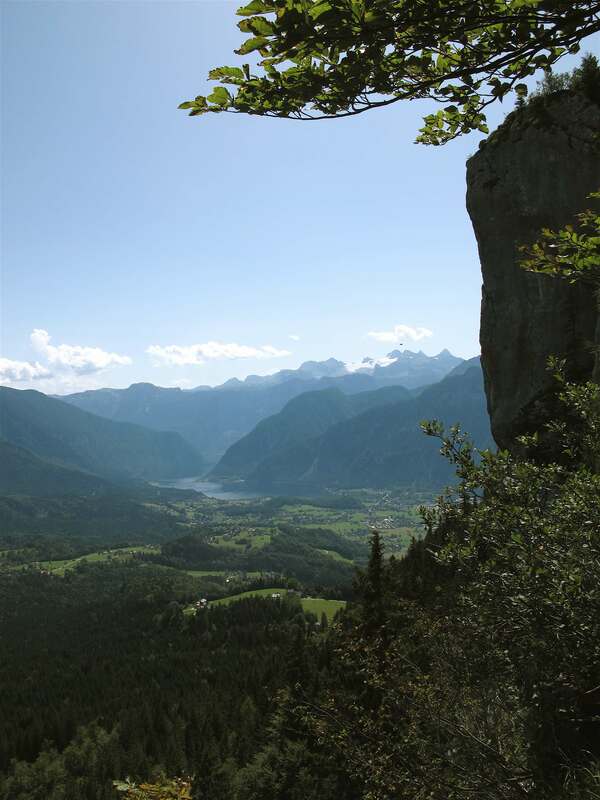 Then one of three options for returning to Bad Goisern. 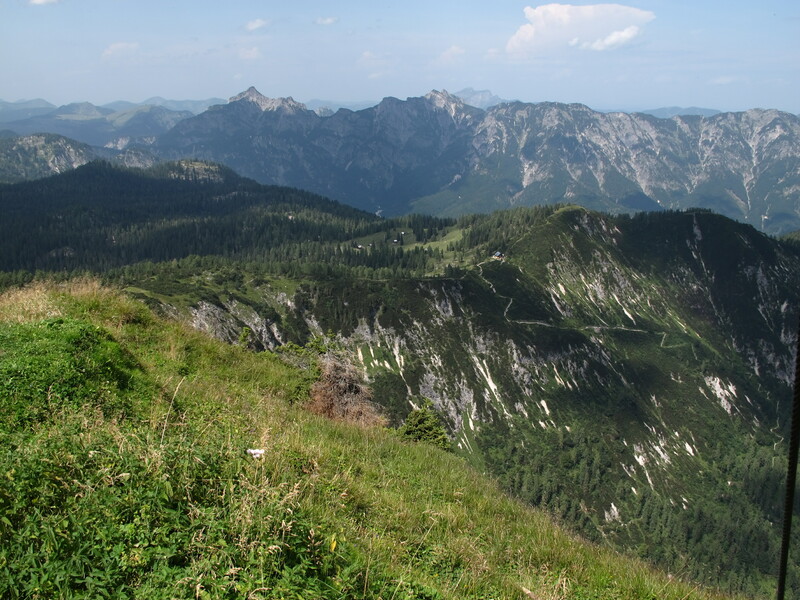 The median peaks here are around 2000m, and forested. 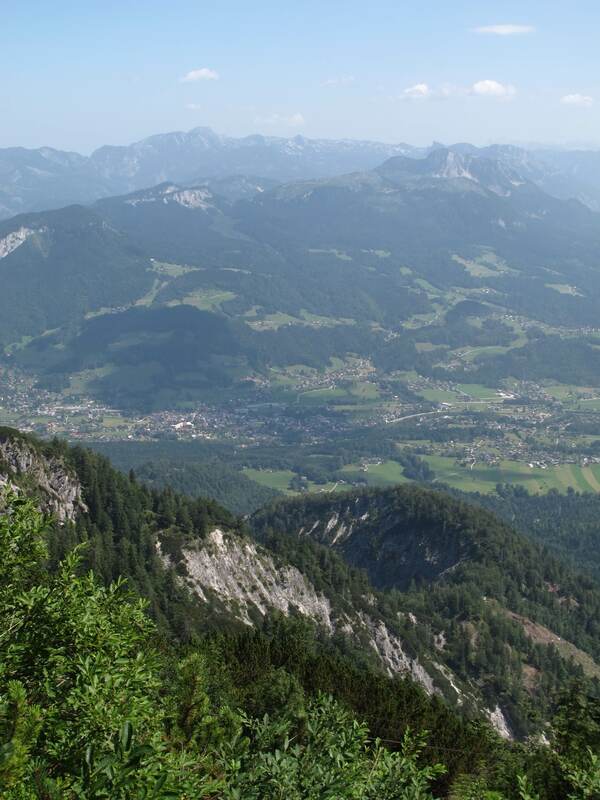 On the horizon is Hohe Dachstein (not ‘Hoch’, we’re in Austria) which peaks at five metres under 3000. Krippenstein which figures later is the first decent bump from the left. 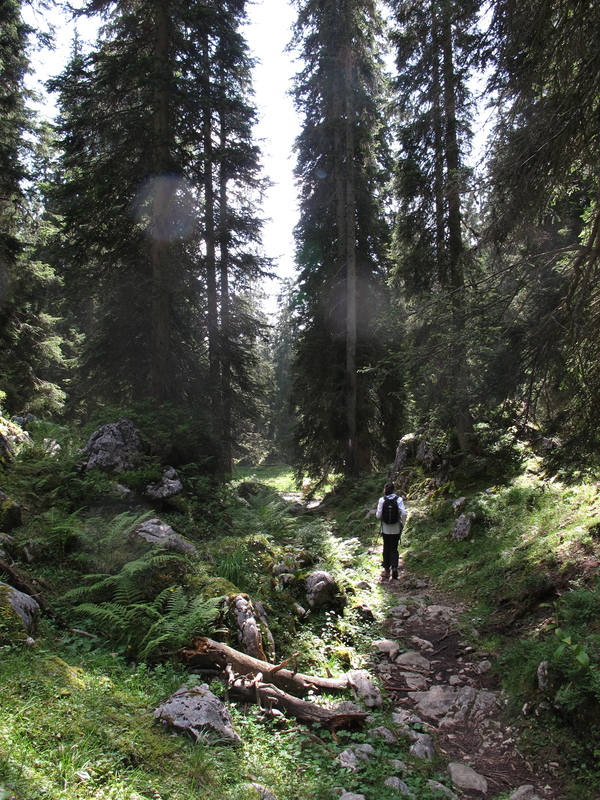 The next day was the traverse to Gosau. I thought I knew where we were going. We would sidle west past the worst of the alp and then come round the back as it were. But no! That idea may well even have been un-Austrian. Straight up and over. You will see the track in a picture below. Fierce. I was painfully hot and thirsty when we got to the Hut at the top of the track, and nothing would have been nicer than the several large beers which were available. There are two themes here. The heat seemed to have limited impact on the locals who were certainly not slipping, slopping and slapping. 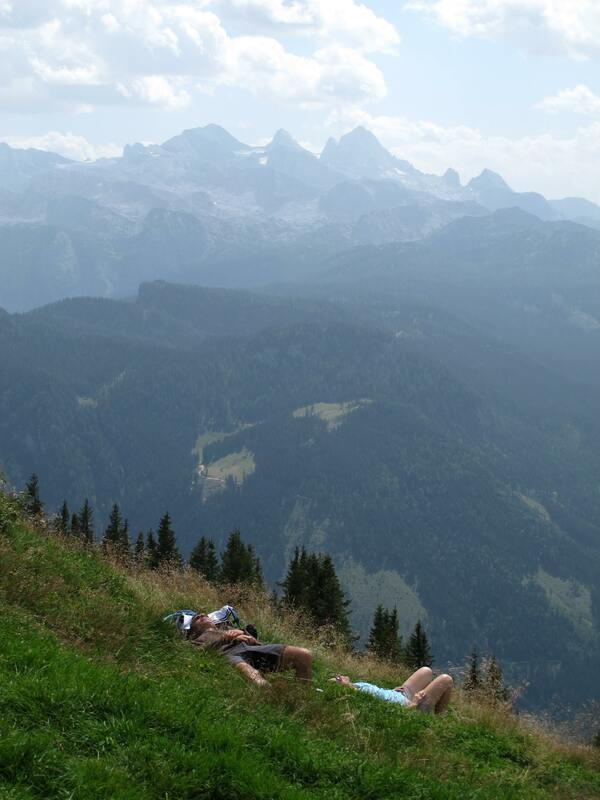 Clothes off, lying in the sun, which at midday at 1800m. was no nonsense heatstroke material. That’s what I thought. What was actually going on was sipping, sopping and slurping. 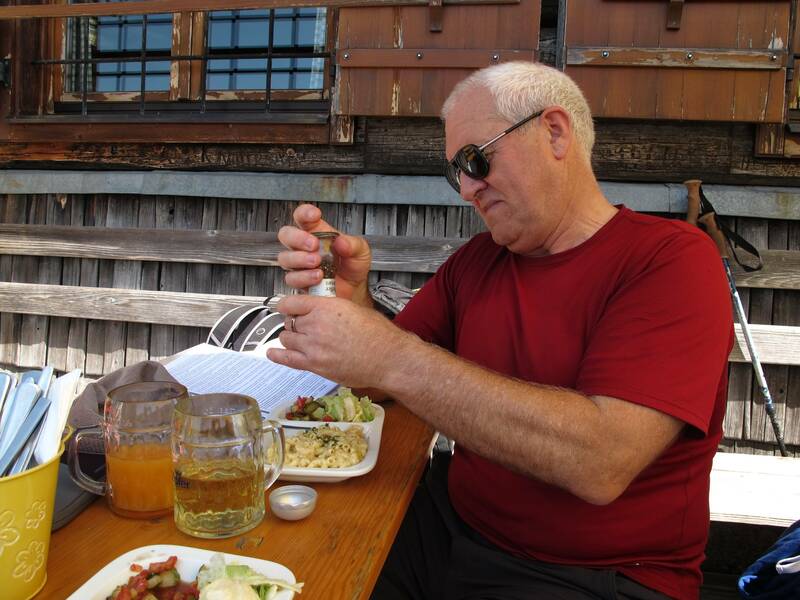 After I had eaten my macaroni cheese and salad we climbed higher to Kalmbach, had a sit down and a look around, came back. This would have taken an hour or so and, as measured by the empty bottles, the folk who had been tucking into the beer when we left were now into their sixth or seventh half litre. There are only two ways down, the way we’d come and the way we were going, and neither were what you’d describe as a doddle. Lord knows how you’d go with a skinfullagrogg. Macaroni cheese and salad did you hear me say? Most of the way up a mountain? Yes. Not in Australia. But people who want to have a feed have been climbing over these hills a long time. Mine host, his wife and daughter lived in a section of the hut, and none of them felt compelled to whiz down below to Maislinger’s for a quick feed and a yarn. Provisions came up a cable lift. This was mid-week and about 30 people were on the mountain and patronising the hut. A few days later on the other traverse we ran into the Gosauer Bummelzug (slow train), a carriage affair pulled in this instance by a tractor, which had brought about that many people to another high hut to tuck into the Zipfer and the Steigl and the stodgy but comforting fare. (There’s probably important research somewhere about the way in which cheese absorbs alcohol.) They were roaring by the time we found them. In fact their noise helped us find the track which we’d momentarily mislaid. But far be it from me to look down my nose. It was a great day for a beer. 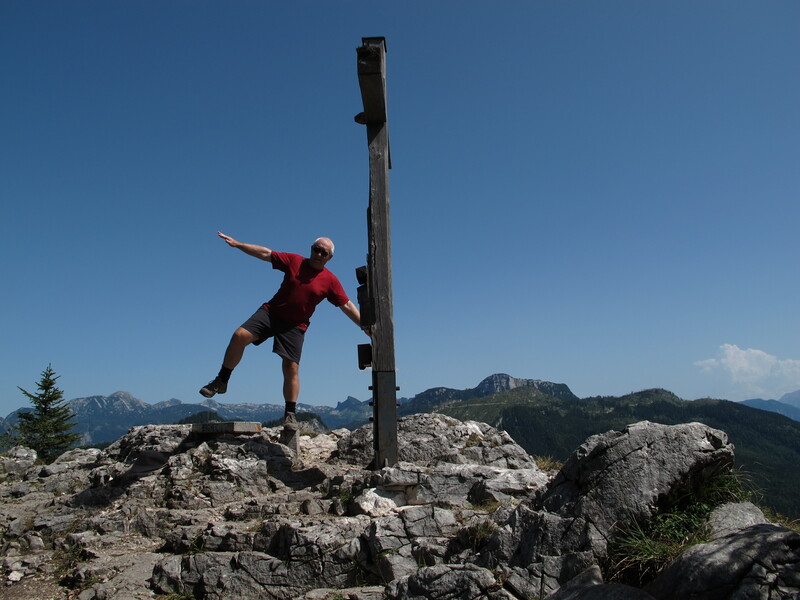 At 1833m the top of Kalmbach is well up and affords, or on this beautiful day did, a wonderful view over the surrounds. As the long lens of the G12 so capably captured, we could see the pool in Bad Goisern if not actually count the number of swimmers. 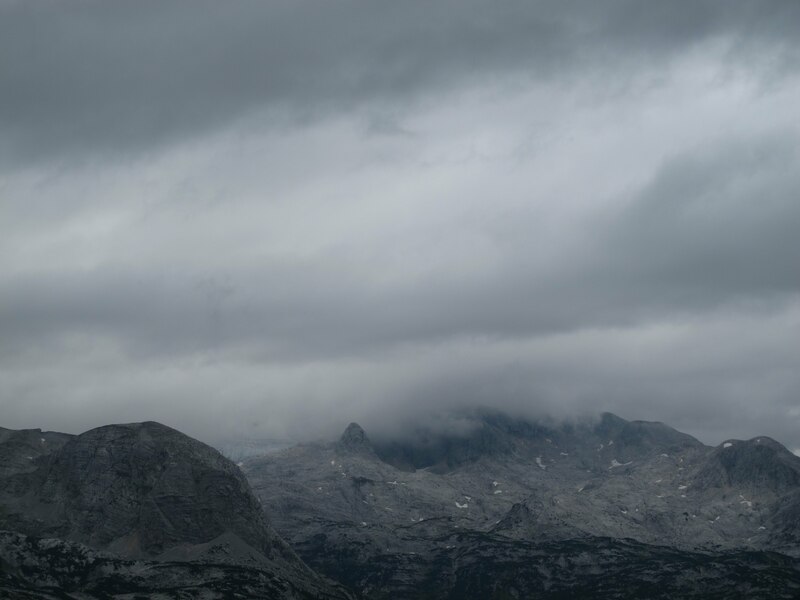 I was taking various snaps from on high — the hut is very nicely exposed from the summit — and it wasn’t till later that I found that I could see the track very plainly. (It is also visible in the photo to the left I realise, but from a more oblique angle.) And here it is, dropping off into nothingness. 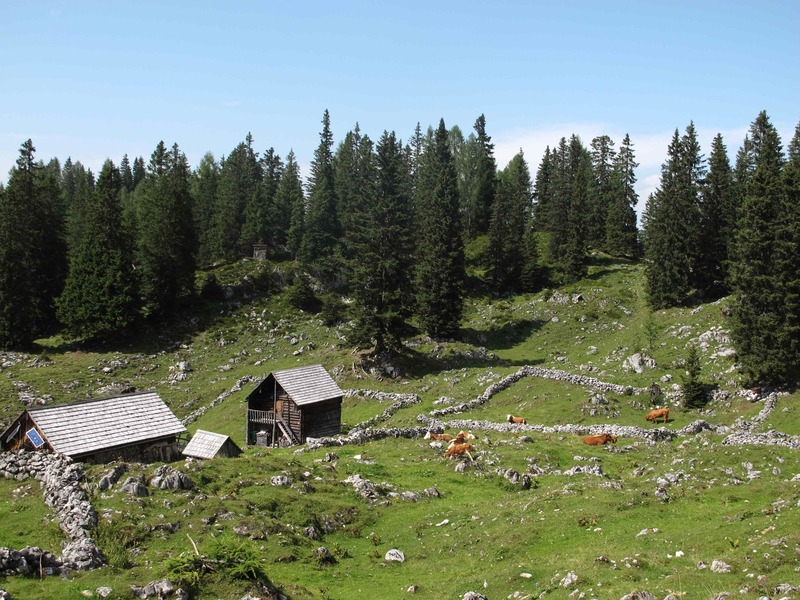 The kilometre or so across the tops was amongst the nicest walking in the six days, alpine meadows strewn with rocks, cows and huts — soft underfoot, shady and picturesque. 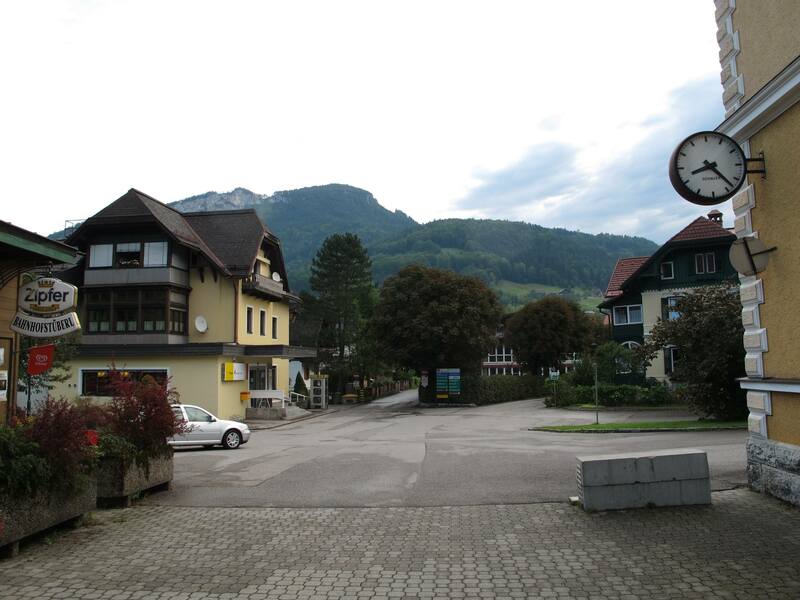 And after four or five hours, having had a willing and cheerful conversation with some folk whose English was as good as my Hoch Deutsche near another of these bars in the sky, we got to Gosau, or actually a kilometre past because that’s where our gasthaus was. There is plenty of joy in such arrivals. It had been an athletic day. The next day was a choice from a set of relatively easy options. 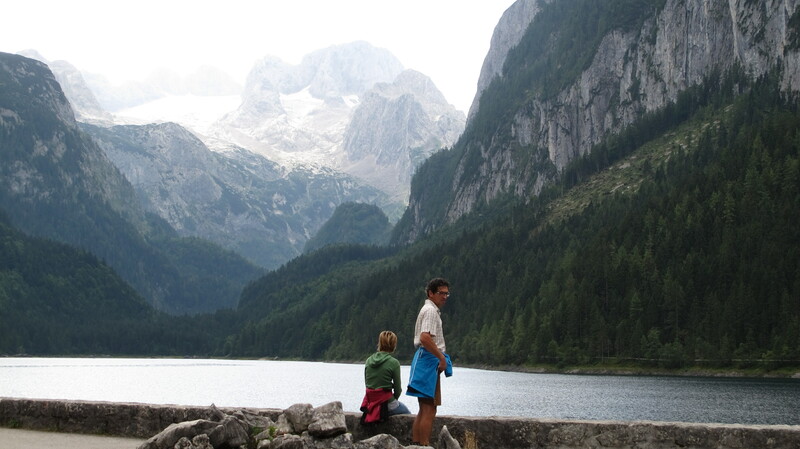 We chose to take a bus to the Gosausee, walk around it and on up to its higher sibling, seven k.s up and seven back. 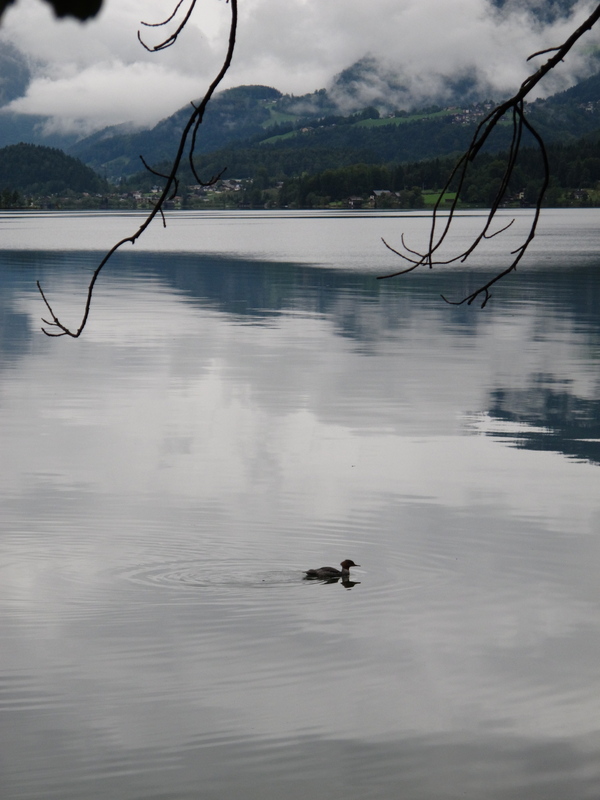 Myrna swam in the upper lake while I shrank into the shade and prepared, ate and thoroughly enjoyed, lunch. That night there was a phenomenal electrical storm. I was at our third floor window watching and listening to the slow glop glop glop of tropical raindrops while the fairies played with fire behind the Gosaukamm (the range at the rear). Then, smack bang, the metaphorical roof fell in. The next day as we left for Halstatt there was still plenty of water around , but as we discovered subsequently the real damage had been done at our destination. Another fabulous day of walking. 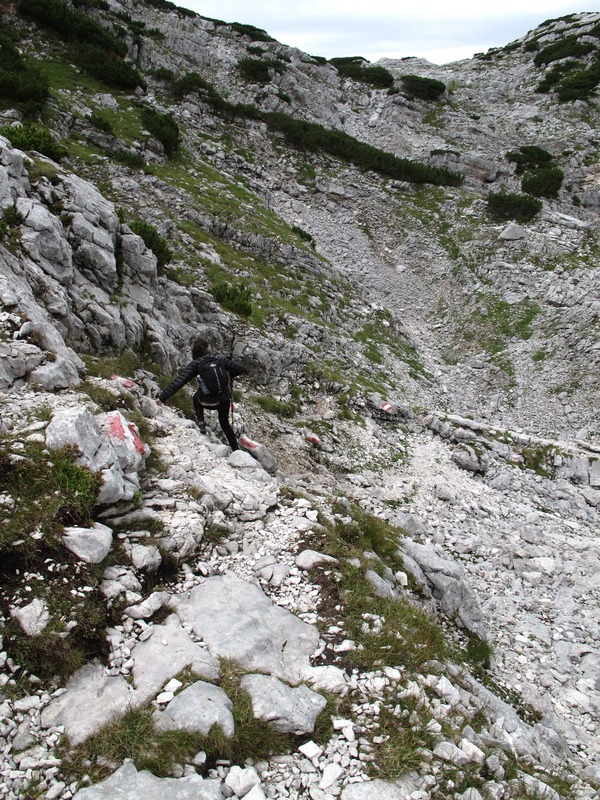 ‘Climb steeply through the forest’ was the most common phrase in the track notes, and while this wasn’t the one hit wonder of a couple days before, it was a series of recurrent solid climbs replete with a good many false dawns. We found the crack in the limestone inhabited by the wild female spirits of Lockenmoos, and only a solitary other soul on the track to whom I gave incorrect directions in French. This day is full of character and I mention only the extraordinary descent at Durchgangalm, 150m in 150m, and what we found at its bottom. 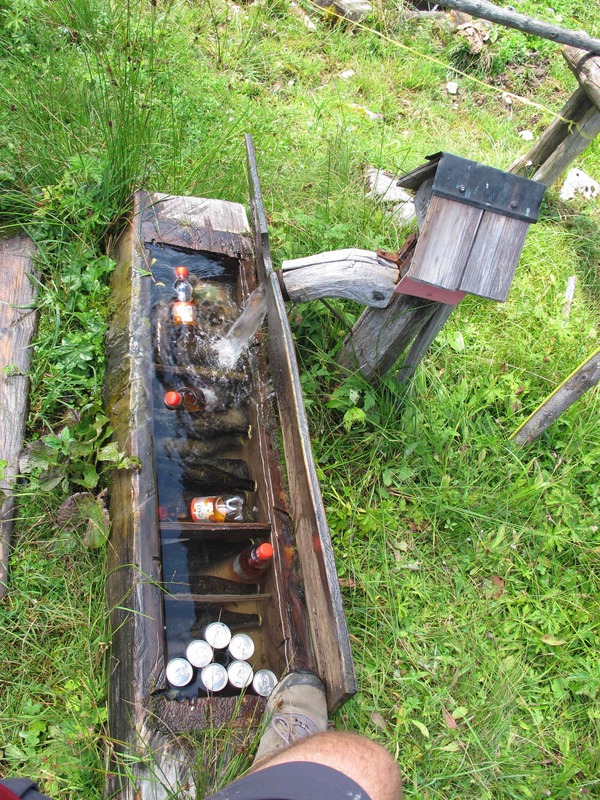 The track notes had mentioned that we might find a spring which kept cold a box of beer, soft drink and iced coffee. That’s one of those long shots that might or might not come off, a fabulous dream. The author of the notes may have been hallucinating at the time after a big day. But, lo and behold, photographic evidence. The weather was still hot, we had had plenty of strenuous exertion, and the chance to drink something other than water, and cold, was somewhere near sensational. I see this photo as belonging to the genre of the advertisement. I was very happy to overpay the honesty box. This walk. A thrill a minute! There’s a lot to say here about massive ancient salt works (which gave Salzburg both its name and its wealth and prominence) and the Halstatter culture and one of the largest cemeteries ever found in the ancient world and rockfalls and fires and pumping brine a score or so of kilometres through wooden pipes in the 16th century and startling beauty which has not gone unnoticed by Japanese tourists. Not to mention Emporer Friedrich’s favourite dessert (scrambled pancake in plum jam: true, and rubbish). But we’re keeping things moving here and you’ll just have to go yourself. 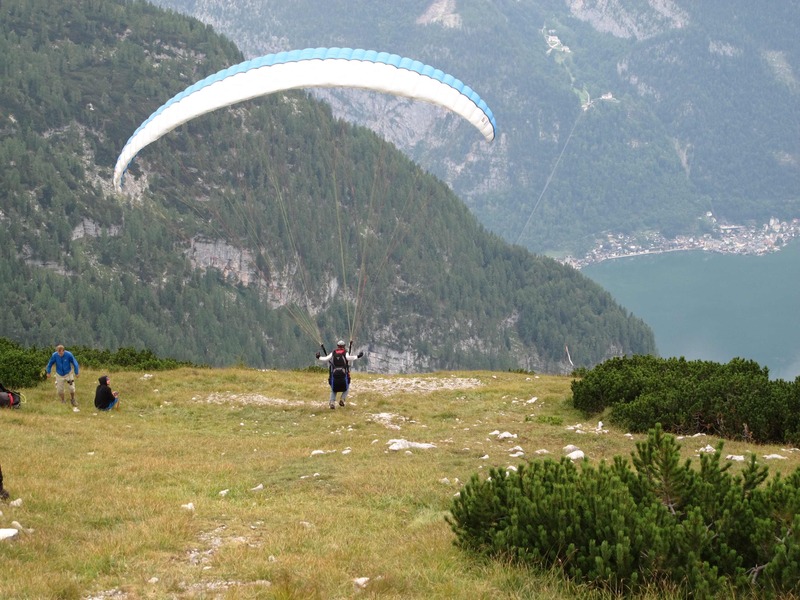 The notes were emphatic that the last few k.s down into Halstatt should be walked. The alternative is a funicular which costs bugger all, takes no time and runs every 15 minutes. Who on earth would be interested? However, we were spared even the consideration of the options by the fact that last night’s storm had destroyed a lot of the walking track and brought down a tree that had nearly truncated access to Rudolph’s Tower, a dramatic landmark above the town on the way down. This would have meant no cup of tea and no beer while we waited for funicular. Think of that. Picturesque or what? 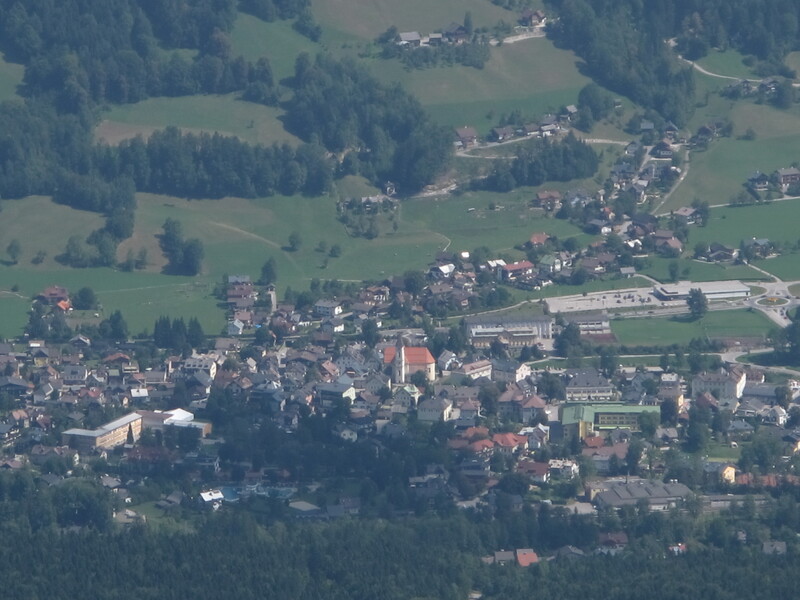 This is the seven-millionth photo which has been taken of Halstatt from its suburb Lahn where there is a small patch of flat land. 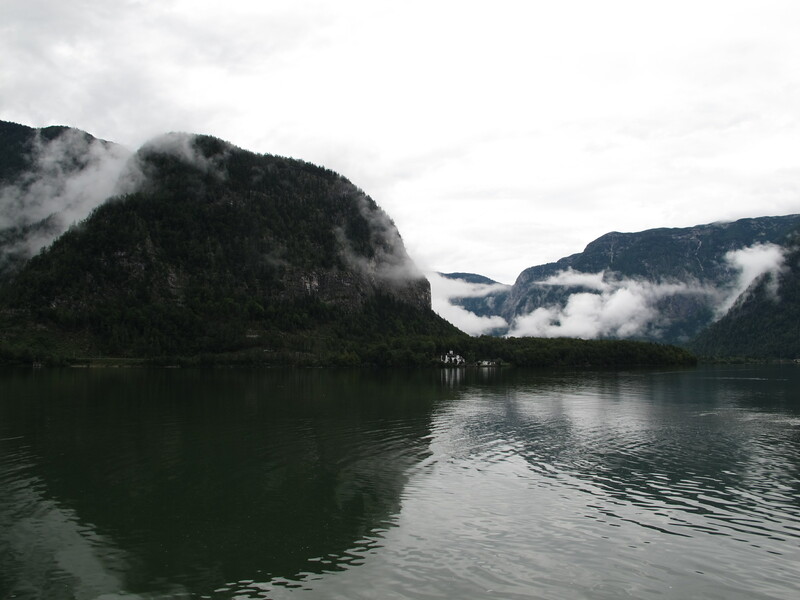 As intimated, there is a lot to say about Halstatt, and we weren’t barbarians. We went to the museum and the art gallery and walked the streets noting the remarkable houses. We ate some fancy local variety of fish of which there are plenty in the lake. We ooed and ahhed (that’s more me really) at the evening cloud pour through the high valleys and down the cliff faces, and aahed and ooed at the inhabitants of the dozens of luxury buses pulling up at the Lahn bus station. 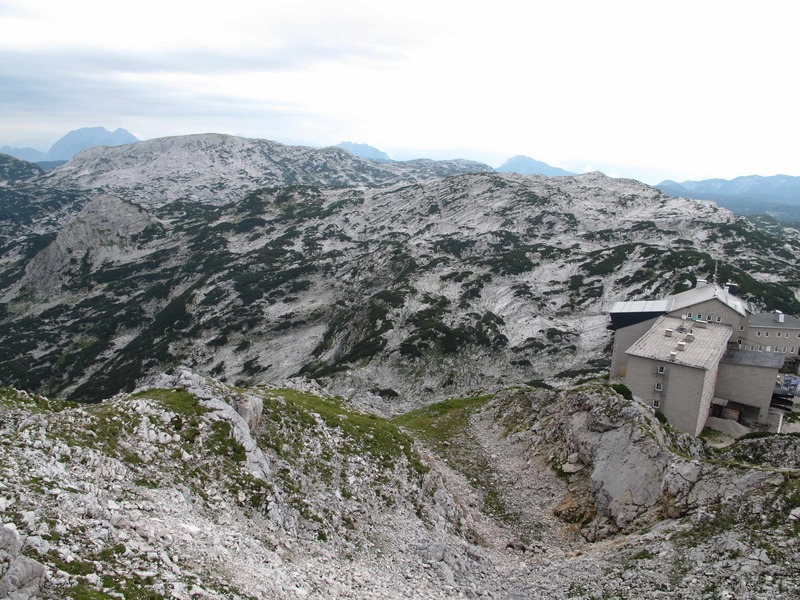 And then there was Krippenstein, the nearest high mountain, accessible by bus and cable car. This was our choice of the next day’s options — up to the top by these means and then walk back half way by what looked like a promising route. 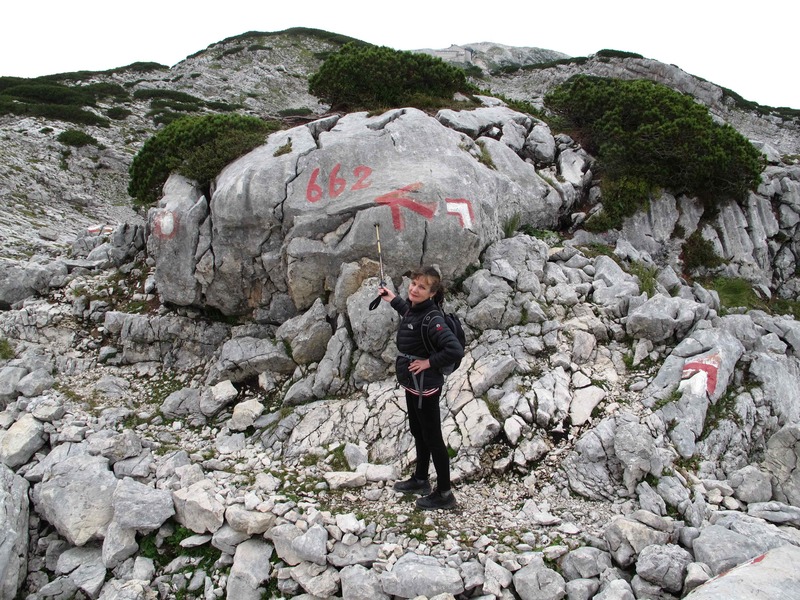 Krippenstein has a ‘nature’ walk to look at karst (a type of limestone) formations. That would have been good I’m sure. But they were everywhere. It was a bit nippier up the top with a brisk wind. And there were several ways down. But we went for the terrestrial, which was, as it turned out, full of remarkable scenery combined with a very enjoyable series of rock scrambles. We have here i) a fine example of the subtlety of Austrian waymarking, and ii) a role model for the older woman. And then, as they say, we went home. 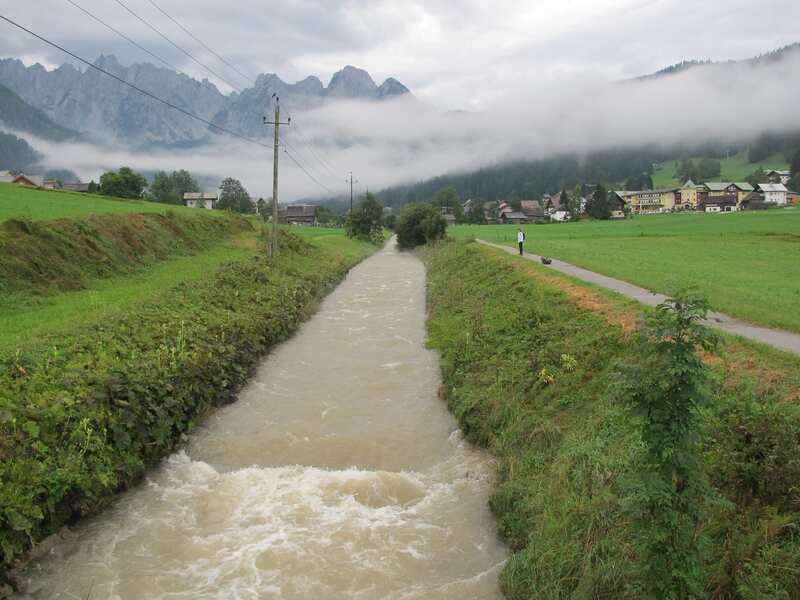 Of the three options, the storm had knocked out two, which initially seemed a pity because we had planned to follow the Soleleitungsweg (‘the way of the brine’). Signage warned with great vigour of attempting to do so. Rockfalls had broken the track. So we got the ferry across to the other side and strolled around through the joggers and picnickers enjoying their Sunday. I was reminded for some obscure reason of Böcklin’s ‘Isle of the Dead’. This duck ‘followed us’ (can I say ‘a duck followed us’? Well it just did.) swimming full tilt for about a kilometre and a half, came towards the bank and then did nothing. I’d like to know what that meant. It was raining steadily for the last couple of k.s into Bad Goisern, pleasant really, and we arrived back in the middle of some weekend fair/celebration/possibly normal Sunday behaviour. 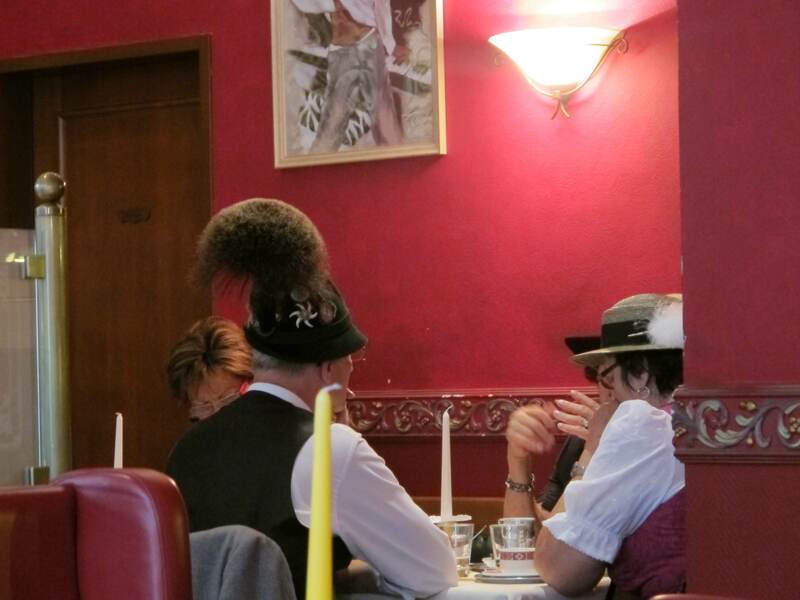 But the world was out in its lederhosen and dirndls, and the sound of an oompah band was floating through the streets. 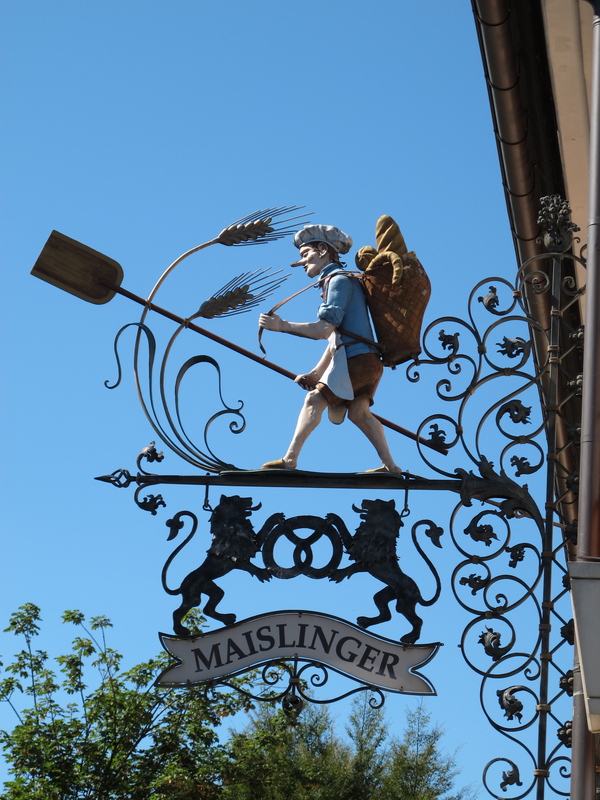 We found Maislinger’s packed to the gills with people who know a good feed when they see one (and at the same time are inclined to wear what they’ve shot) but managed to sneak a couple of seats and eat some of the best pork ever. Hear that? Ever. Were treated very kindly at our hotel, the Moserwirt, did some washing, slept soundly and got on the train next morning headed a little further east for something completely different. Wow! 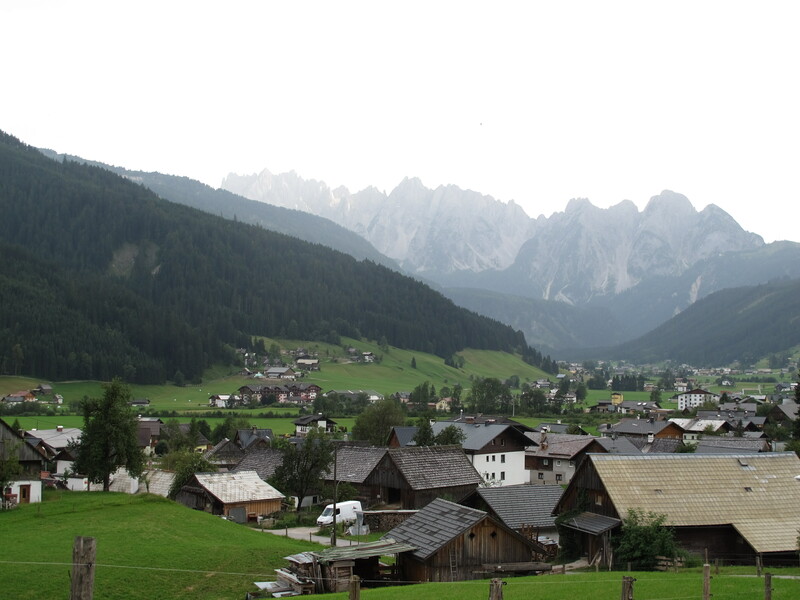 Your descriptions bring back very vivid memories.My friends and I did the same recently,also with Sherpa’s unguided walk, We had good weather,even though it was late October.It rained on the day we took the panoramic walk to Gosausee. 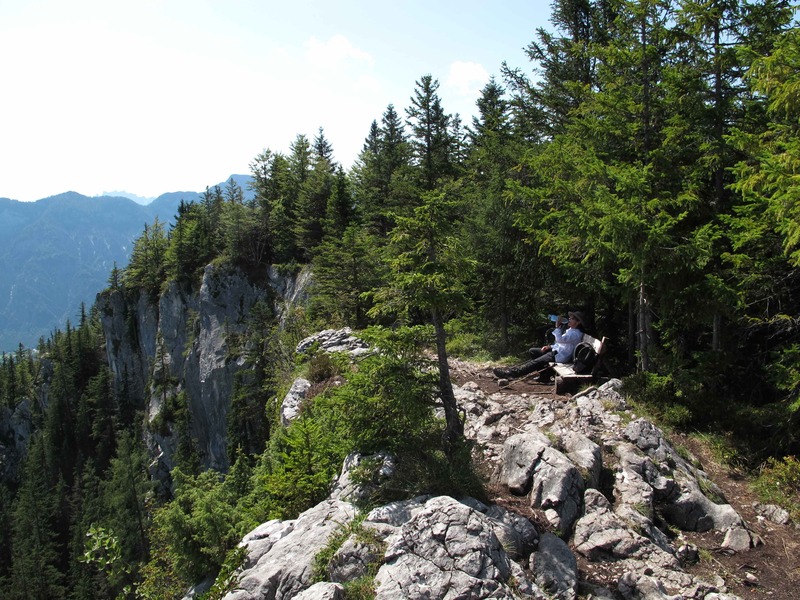 Our way down to Hallstatt was blocked by fallen trees,and as the funicular was not running by the time we reached the station ( we got the wrong funicula timetable :<( ), the scramble over and under the trees was quite an adventure in itself !